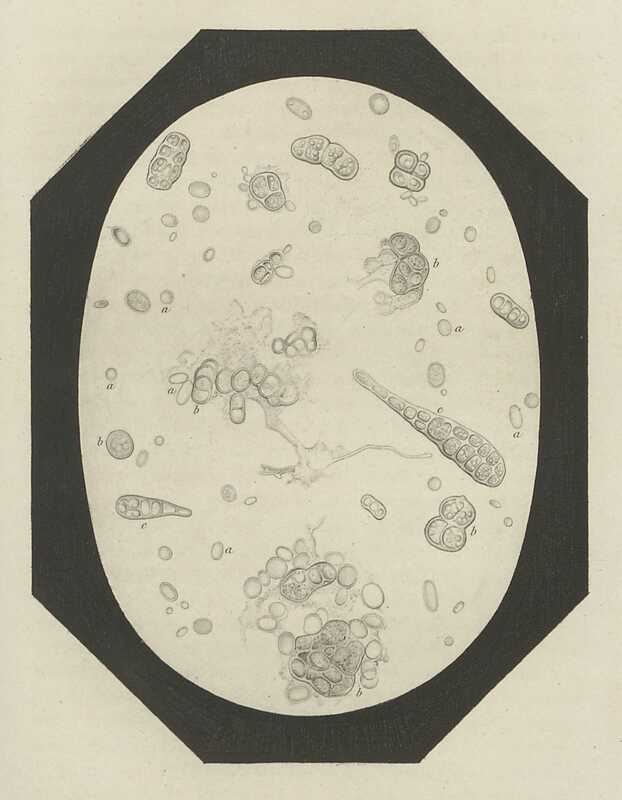 Ancient Roman scholars had speculated on the existence of microorganisms and particles that could not be seen, but it was not until the invention of the microscope in the 17th century that the cell and microorganisms could be observed first hand. The first documented analysis of a cell was by Robert Hooke in 1666. His microscope could only produce a magnification of 30x. Shortly after, Anton van Leeuwenhoek improved on this equipment, achieving a magnification of 270x, and was able to see single-celled life. In the 19th century, advances in the compound microscope and scientific procedure allowed for better study by people such as Louis Pasteur, the ‘father of microbiology,’ whose contributions to bacteriology transformed modern medicine. Smaller still than the microscopic scale was the atomic level. Writing in the mid-19th century, Mary Somerville could state confidently that all matter was made up of atoms—particles that were tiny and indestructible. 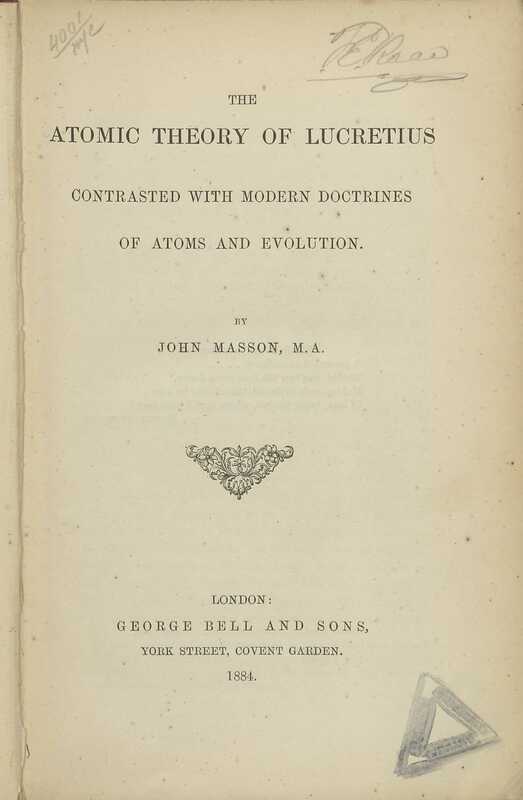 It was not until the 20th century, however, that scientists arrived at an understanding of particles, much less sub-particles, and how atoms were structured. This book was first published in French as Etudes sur la Bière in 1876. Pasteur’s studies in bacteriology and microbiology revolutionised medicine in the field of disease prevention through the development of germ theory. His work was initially applied to pasteurisation in the milk, wine, and brewing industries. From the collection of Richard Travers. Donated under the Cultural Gifts Scheme. In 1928, Fleming, along with Ernst Boris Chain and the Australian Howard Florey, manufactured the first antibiotic, benzylpenicillin (or Penicillin G). The three were awarded the Nobel Prize in Physiology or Medicine in 1945. 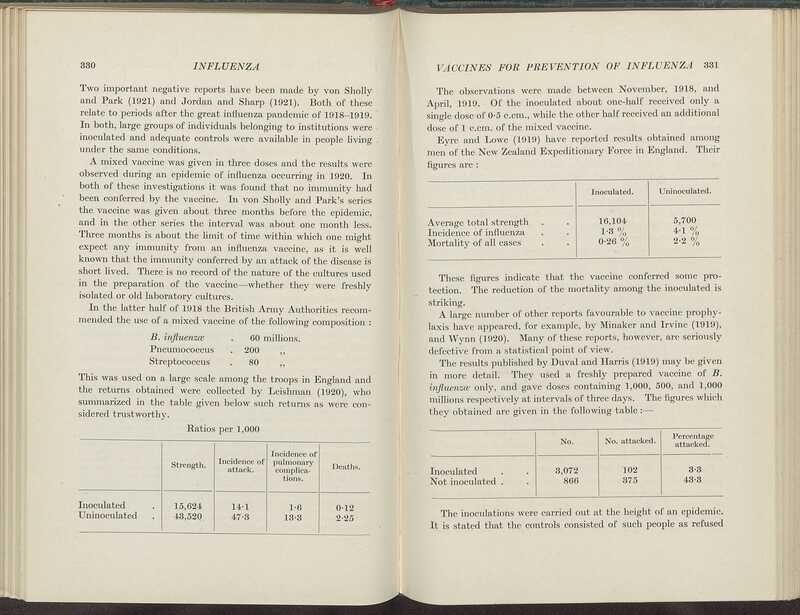 Shown here is an item representing epidemiological research on vaccines for the prevention of influenza, with a table showing its spread amongst inoculated and uninoculated patients. Born in Scotland in 1780, Mary Somerville became one of the most prominent women of science in the 19th century. She was a polymath who excelled at science communication, relaying complex scientific ideas and discoveries to the public. 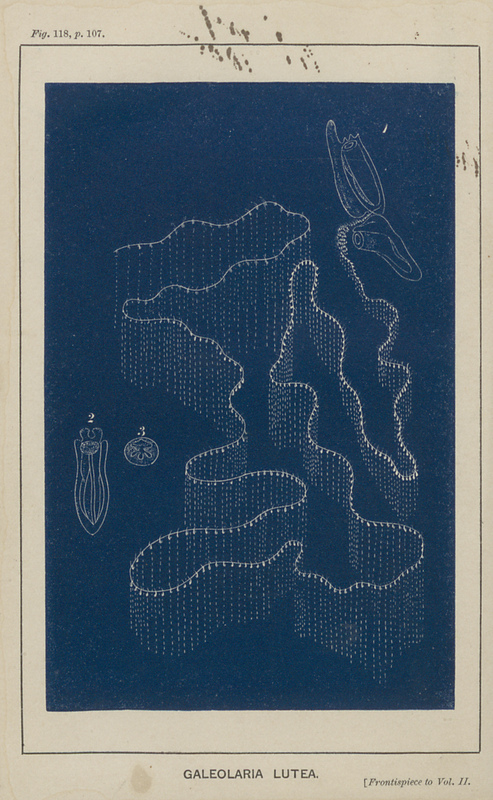 Her first major work was Mechanism of the Heavens (1831), a translation of Pierre-Simon, Marquis de Laplace’s Mécanique céleste (1799-1825) that also made the text accessible to a general audience. Her contributions to astronomy led to her being elected an honorary membership from the Royal Astronomical Society in 1935; Caroline Herschel was also elected and the two became the first female members of the society. Somerville’s proficiency as a polymath allowed her to make connections between a wide range of scientific disciplines. Her Physical Geography (1848) was the first English-language textbook on geography and saw her awarded the Victoria gold medal of the Royal Geographical Society. She was also the tutor of Ada Lovelace and introduced her to Charles Babbage, with whom Lovelace would work on the Analytical Engine. 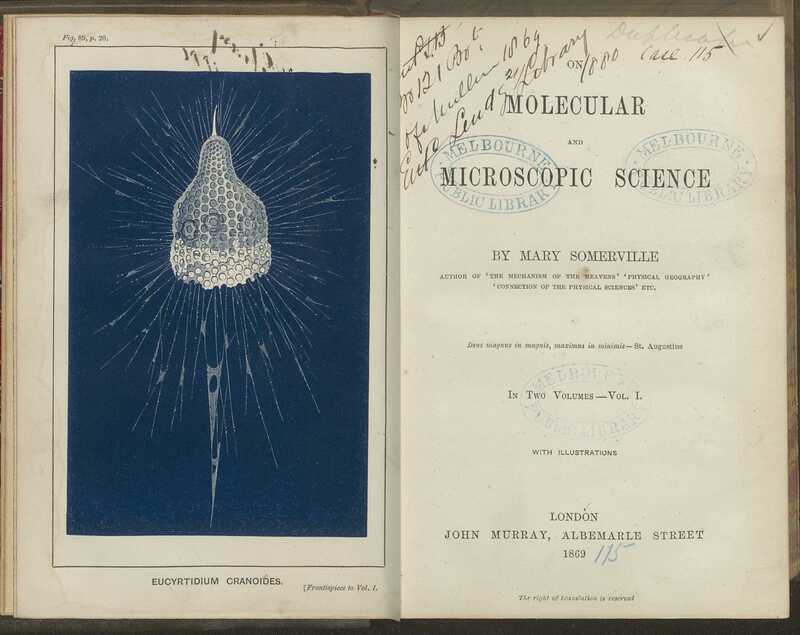 On Molecular and Microscopic Science was Somerville’s last book. 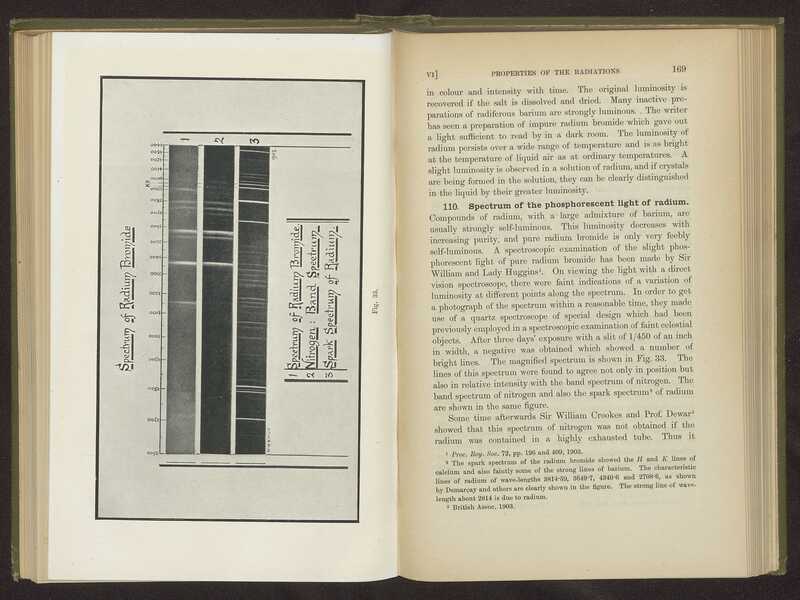 In it she presents the cutting edge ideas of 19th-century research in the microscopic sciences to a wider audience. These new ideas of atoms and molecules were largely untested, but offered new directions for scientific investigation that would have to wait for the 20th century to be properly realised. 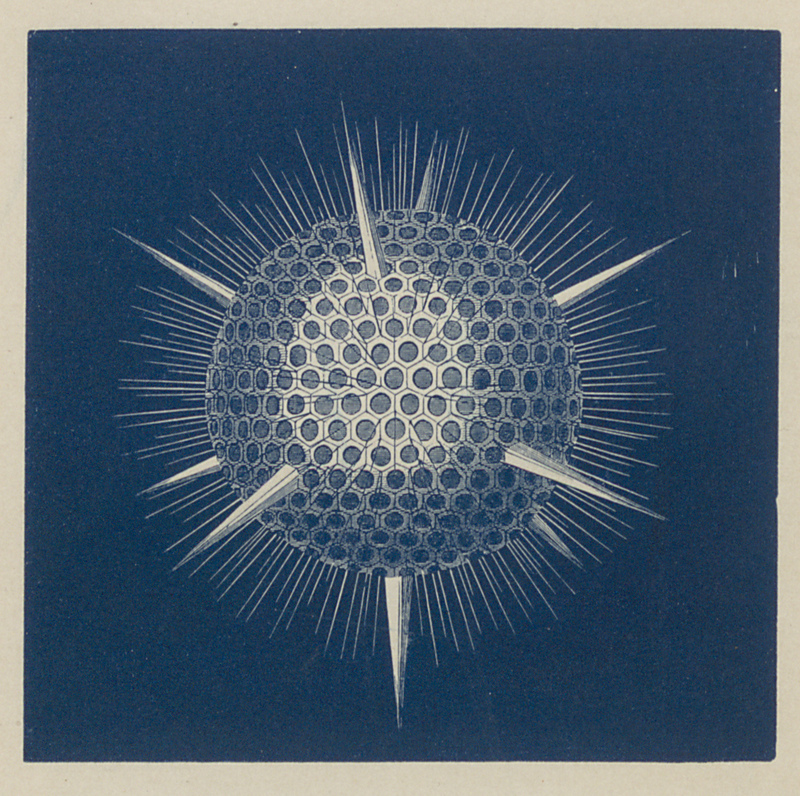 The work also contains stark blue-and-white images of protozoa throughout. Microscopes date back to the mid-17th century, but it was not until the late-19th century that they advanced to a significant degree. These advances were the development of condenser and objective lenses that allowed sufficient light and magnification. 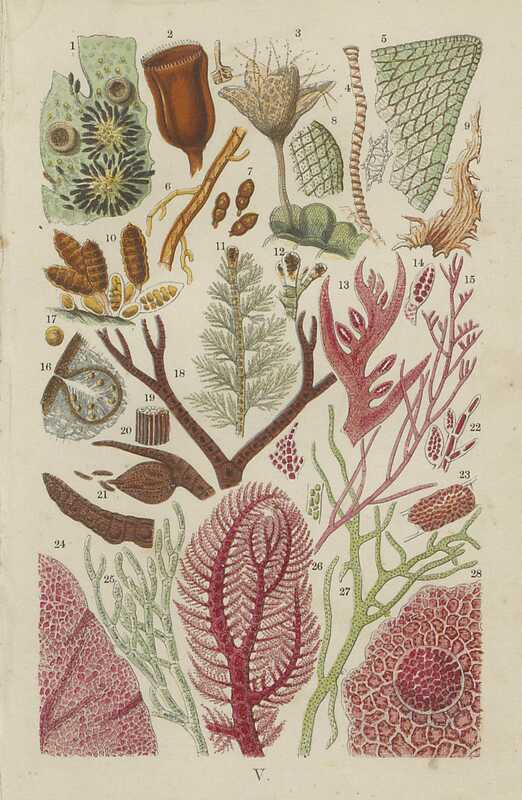 The wondrous world of the microscope was not available to the general public until the illustrations in Common Objects of the Microscope showed what they had been missing. The final pages of the book provide the reader with a handy catalogue of microscopes and telescopes for purchase. Atomic theory goes back to the Greek philosophers. Lucretius set out to summarise these ideas in his De Rerum Natura. In it all nature is described as being made up of atomic particles and the space in which they move. The characteristics of any natural object are then defined by the combination of these two things. The theory was not widely accepted because it contravened religious doctrine, but thought was advancing in the late-19th century to allow these ideas to rise again. Rutherford conducted an experiment with his assistant Hans Geiger in 1911 where they shot helium atoms at gold foil. Some would bounce back. From this observation they concluded that the atom was mostly empty space. The particles that bounced back were striking the nucleus of the atom.